Whether buying or selling a diamond, Causeway Coin Co, is the best place for you to get top value on your diamonds. We buy loose diamonds, diamond watches, diamond rings, and more. We are always looking for diamonds 3cts and larger. 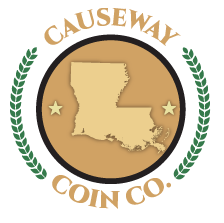 Stop by Causeway Coin Company today for the area’s finest diamonds. Metairie and New Orleans, LA residents can stop by our local shops on weekdays during normal business hours to sell watches. Call us at 504.832.8050 today. We’d be thrilled to set up a time for you to meet with a diamond expert.